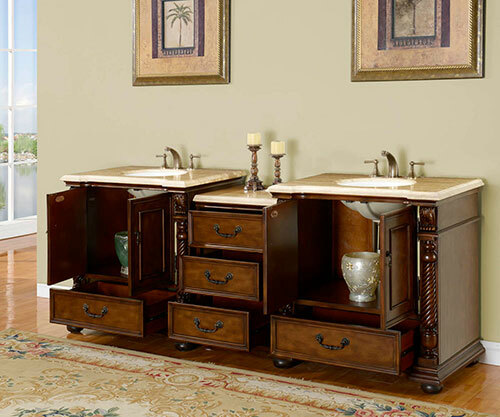 The 91.5" Kostas Double Sink Vanity offers double the function and style as its single sink version. Featuring a cabinet finished with a warm Walnut finish and intricately carved with detailings all along its front, this vanity offers a style that is perfect for master bathrooms. Its cabinet offers two double-door cabinets and four fully-functional drawers with full-extension ball-bearing glides. 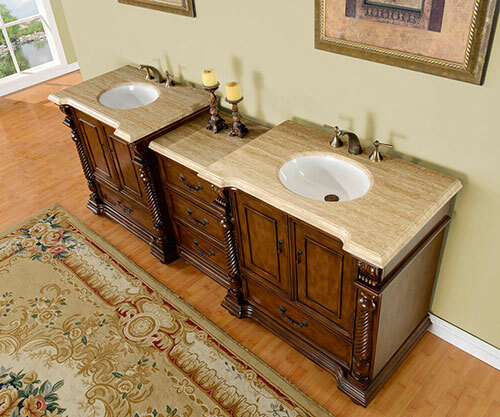 It is then topped with a Roman Vein-Cut Travertine top that's matched with two white ceramic undermount sinks. Faucets are not included.